On our second day we visited the Badaling section of the Great Wall. This is the busiest section as most visitors come here to see the Great Wall. There is a choice of going right for the easier walk but longer route or the steeper walk with shorter route to the left. We chose left, the shorter & tougher walk. Despite the souvenir stalls & souvenir vendors along the wall, the impressive surrounding scenery of hills & beyond is magnificent. The tail of the Wall can be seen snaking off on the mountains into the distance like the claws & body of the dragon. 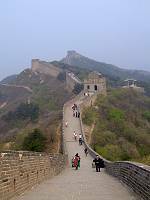 Walking on the Great Wall is far different to any walk on earth. It is not only the scenery but also the history & the achievement of this magnificent work built by many thousands of Chinese people & responsible for many thousands of deaths. Although there are some parts that have been restored there are many original parts of the Great Wall that you can still see. During our walk we saw three old local Chinese people (2 women & a man) walking with their children, using their walking sticks. They were all about eighty years old. They walked the whole length of the restored part of the wall, as we did, then back again through uphill & downhill without any struggle in a determined way, with happy faces. They were very proud. It is this little pleasure that made the walk on the Great Wall so enjoyable. After lunch we visited the Ming Tombs. This is the resting place for 13 emperors. The entrance is the impressive Ling Men main gate. Beyond that lie a series of courtyards & the Hall of Eminent Favours (Lingen Dian). The Soul Tower (Ming Lou) & the burial mound. lie beyond that. 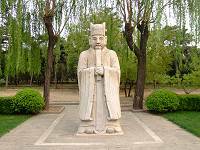 There are three tombs that are opened to the public – Chang Ling, Ding Ling & Zhao Ling. It is a long way down many steps to the tombs. The road leading up to the tombs is called the Sacred Way . It starts with the Great Palace Gate. Under the archway there is a giant mythical half tortoise & half dragon animal. Beyond this a long ceremonial walkway is lined by statues of 12 different animals & officials on both sides, guarding you all the way. This is a very pleasant walk particularly with little white flowers flying in the air from the nearby trees at that time of year (early May) making it more spiritual & mystic. Unfortunately they are beginning to put on western music near the gate for the tourists. As a contrast, we went the next day to another section of the Great Wall at Mutianyu. This is a much quieter section of the Wall with fewer visitors & no souvenir vendors on the wall itself. 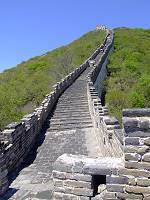 The walk was easy for the first part of the Wall, but at the end of the restored part there is a very steep uphill (almost vertical) flight of many hundreds of steps. If you can do it & are not worried about heights it has a wonderful view from the top. You have to come down the same way as the section beyond is closed due to damage of some parts of the Wall. Maybe due to that day being the 1st of May all the local Chinese would be gathering in Tiananmen Square for the celebratory May Day parade. 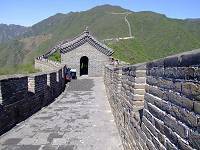 We found this quieter walk on Mutianyu Great Wall extremely enjoyable. Whatever the reason personally I have achieved my childhood dream to see & walk on the Great Wall of China. I read the history throughout my school days in a Chinese class in Vietnam I now have fulfilled one of my wishes in life. After lunch we arrived back to Beijing & visited the famous Summer Palace. 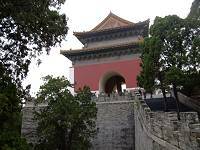 Because it was 1st of May & the beginning of 'Golden Week' holiday the peaceful & beautiful Summer Palace was now filled with thousands & thousands of visitors (tourists & local Chinese) among the landscape of temples, pavilions, corridors, lakes & gardens. I have never seen so many people in one place at the same time. The majority of the visitors were local Chinese, here to enjoy their outing to the park with friends & family. Boating on the Kunming Lake was the very popular. On a quieter day this is a very pleasant outing to a lovely park & garden filled with history. Tonight we tried two of the most famous things in Beijing, a Peking duck dinner & the Peking Opera. The Peking duck is absolutely a delight. A young Chinese girl dressed in traditional Ming dynasty costume served our duck dinner plus many other different dishes. It was a very memorable dinner. 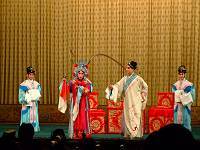 Afterward we attended the famous Peking opera at the Chinese theatre. Whether you can understand the singing or the storytelling the beautiful, colourful costumes are wonderful to see. The acrobatic performance is stunning to watch. The whole 2 hours of performance is very enjoyable. On our final day in Beijing we had to inspect all the hotels that we are using for our guests. That morning after our breakfast we entered the park next to Grand View Garden hotel. It is free entry for hotel guests with a room card. The best time to visit any park in China is the early morning when most local Chinese come to the park for their morning exercise & fresh air. Chinese believe early morning exercise the best way to enhance your heath in the park. There are people (young & old) doing exercise or Tai Chi in groups. There are also individuals standing motionlessly for their inner strength. Some are rubbing their faces, arms & legs. On that morning there was a group of local Chinese singing & playing their musical instruments as well. It is a joy to see this way of life for the local people. Today we visited the 4* Marco Polo (Grand Mercure) & Novotel hotels for our Superior hotel category including Grand View Garden hotel. 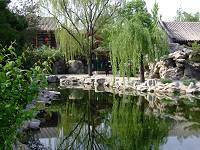 For 5* hotels we visited Wangfujing, Peninsula & Grand Hyatt in our Deluxe hotels category. Next morning we caught an early morning flight from Beijing to Xian.